Klein ISD Intermediate band students participated in the district Solo & Ensemble competition. Students perform for an adjudicator who provides aural and written feedback as well as one of four ratings–Excellent, Good, Fair, or Needs Improvement. Students receive a red, white, and blue medal for an excellent rating or a blue medal for a good rating. Doerre Intermediate had 158 students participating, 71 of whom received a rating of outstanding, while 47 students received a good ranking. Fifteen of these students also earned an outstanding musician award. Hildebrandt Intermediate sent 60 students, 32 earned outstanding and 14 earned good. Six of these students were ranked as outstanding musicians. 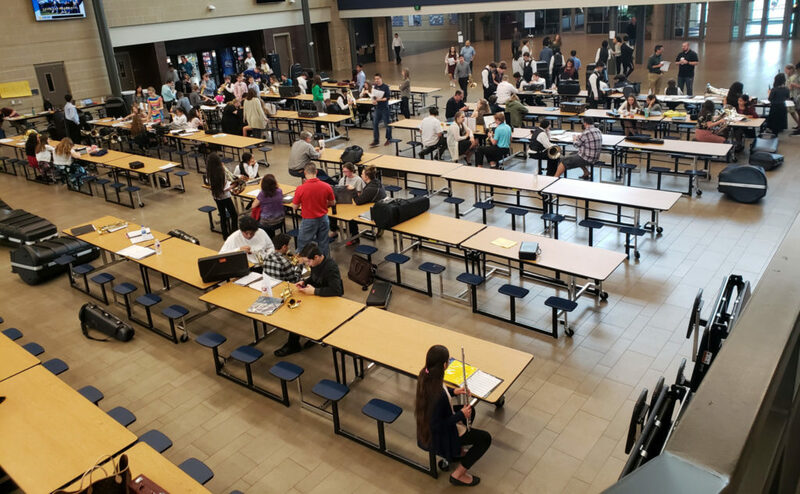 Hofius Intermediate, participating in their first solo & ensemble contest, had 94 entries and earned a total of 90 medals, 68 excellent and 22 good. Ten students earned outstanding musician distinction. Kleb Intermediate was represented by 170 students. Eighty-seven received and excellent rating, 58 received a good rating. Eighteen students received outstanding musician. Klein Intermediate had 58 students participating, eight received red, white and blue, excellent medals, and twenty earned blue good medals. Three students received outstanding musician ranking. Krimmel Intermediate was represented by 112 students and 108 received medals, 81 excellent and 27 good. Thirty one students earned outstanding musician. Schindewolf Intermediate had 112 students participating. Excellent medals were earned by 56 students and good medals by 42. Four students were awarded outstanding musician. Strack Intermediate sent 63 students. Thirty-nine were excellent medal recipients and 17 were blue medal recipients. Nine students were acknowledged as outstanding musicians. Ulrich Intermediate had 236 student participants. Ninety four students received excellent awards and 71 received good. Fourteen of the students received an outstanding musician award. Wunderlich Intermediate was represented by 100 student musicians. Fifty-four were excellent award recipients and 31 were good award recipients. Seven students were outstanding musician award recipients. Congratulations to all our talented, hardworking promise 2 purpose Klein ISD intermediate students and their band directors!